Azriel’s Wish: Park Warehouse donates a custom bench for one of kind football field. Azriel Wasser, a 15-year old battling brain cancer, got the wish of a lifetime with the help from Make-A-Wish of Southern Florida and many community partners. The Make-A-Wish of Southern Florida wanted to build the best backyard football field for Azriel's wish. 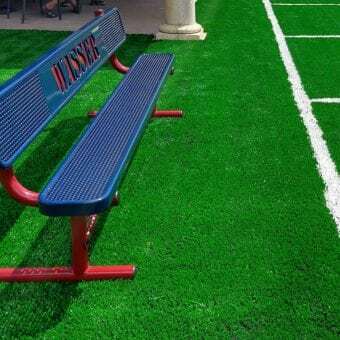 This extensive project was underway when they contacted Park Warehouse's COO, Matt Jones, for a blue and red players bench with a customized "Wasser" logo. Although the timeline for the custom bench request was tight, with a few phone calls Matt was able to get a custom and personalized bench for Azriel's very own football field in time. "As soon as I knew Make-a-Wish was requesting this special custom order for Azriel's wish, I made a few calls and I was able to expedite the order in time for reveal day." When Azriel arrived home from school he was greeted with a customized 65-foot-long by 20-foot wide backyard football field, a project that took about a month to create. His family was able to keep this project a surprise for the duration of its completion until reveal day, where Azriel was speechless with excitement. The state-of-the-art custom Wasser field includes green turf, a scoreboard, a goal post, lights for evening games and a personalized players bench for fans and family to enjoy while Azriel and his friends play touch football in his very own backyard. The custom players bench is an amazing finishing touch for Wasser field. We're so thrilled we could be a part of Azriel's special day and help make his wish a reality. Giving Azriel and his family a chance to make a lifetime of long lasting new and happy memories with his wish is a very cool and is an exciting way to give back to the community. We're glad to work with charities like Make-A-Wish of Southern Florida who have granted over 11,000 wishes that help create life-changing experiences for children with critical illnesses. This chapter grants wishes to children in various counties across Florida and the US Virgin Islands every 14 hours. Park Warehouse carries high-quality commercial site furnishings for all types of indoor and outdoor facilities, like parks, office buildings, schools, and playgrounds. Consumers can purchase benches, bike racks, picnic tables, trash receptacles, bleachers, lockers, grills, dog park equipment, structures, message centers, umbrellas, traffic equipment, and more. While the company is based in Boca Raton, they supply commercial outdoor furnishings to customers throughout the nation. This entry was posted in Custom Site Amenities. Bookmark the permalink.